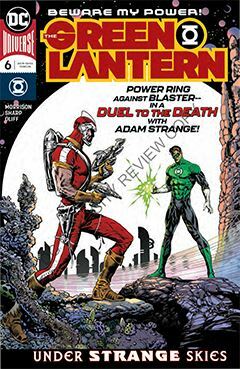 Hal Jordan is undercover among the Blackstars, but to prove his loyalty he must sentence his friend Adam Strange to death. But how much Controller Mu knows about Jordan’s “secret” mission remains to be learned. There’s just not much meat on this bone, as the story progresses, drawn out in a tedious fashion that I believe could have been condensed and made for a tighter narrative. But that’s just my personal preference. I appreciate dense storytelling where the action comes quick and sudden. To me, anything else is just padding. In this chapter, there is a moment that could have been really a major event, but instead it was glossed over and given short shrift. So it makes me question where Grant Morrison’s priorities lie in his writing. Major drama seems to take a back seat to drawn out emotion; to each his own, I guess. As for where the story leads, I am uncertain. The future of Green Lantern seems less about traditional super-heroing, and more about a grand cosmic adventure. But that’s par for the course at DC Comics these days. Everything must be done on an epic scale, because small, personal stories to which every reader can relate just doesn’t measure up anymore.